Where should we invest? 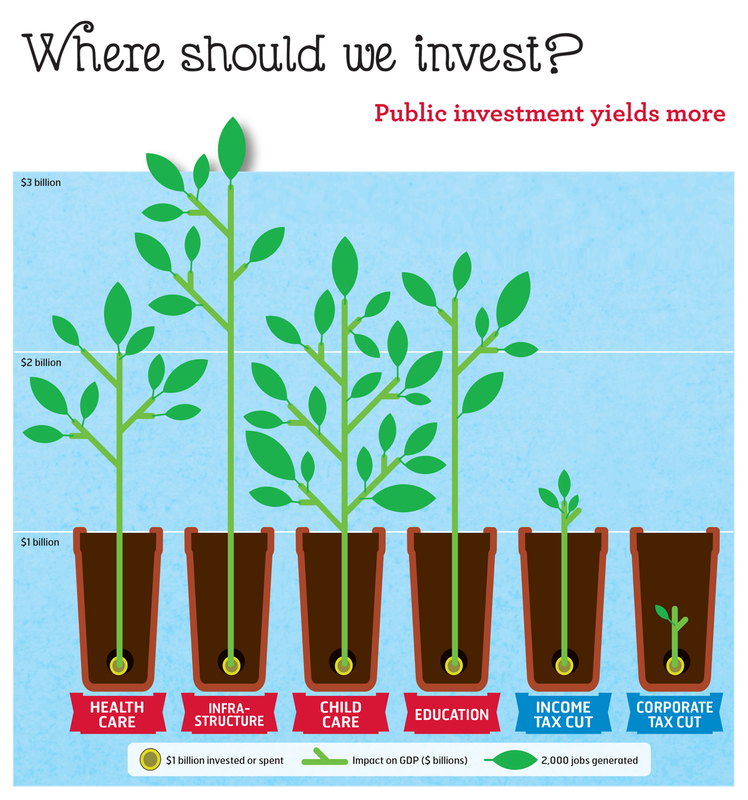 Public investment yields more. Economic growth in this recovery is a third slower than in the recoveries of the 80s and 90s. Job and wage growth have also been dismal. It isn’t because businesses lack money to invest: they have a record $600 billion of excess cash they aren’t investing in the economy. It isn’t because we’re lacking labour: there are over 1.2 million officially unemployed with hundreds of thousands more underemployed. Everything is in place according to the Conservatives’ economic ideology—balanced budgets, low taxes, low interest rates, corporations flush with cash, excess labour, free trade, low-wage growth—so why does the economy stink? As our infographic shows, public spending has a much stronger impact on the economy than tax cuts do. Cutting public spending while also cutting taxes leads to slower economic growth, higher unemployment and lower wage growth. Investment in child care has the strongest impact in terms of jobs and one of the strongest in terms of economic growth while corporate tax cuts have the weakest impact. The infographic is based on economic multipliers from Finance Canada and two highly respected private sector economic analysis firms. Canadians are skilled, hardworking, conscientious and productive. Our economy suffers because our federal government chooses bad economic policies and it’s time to do something about it.